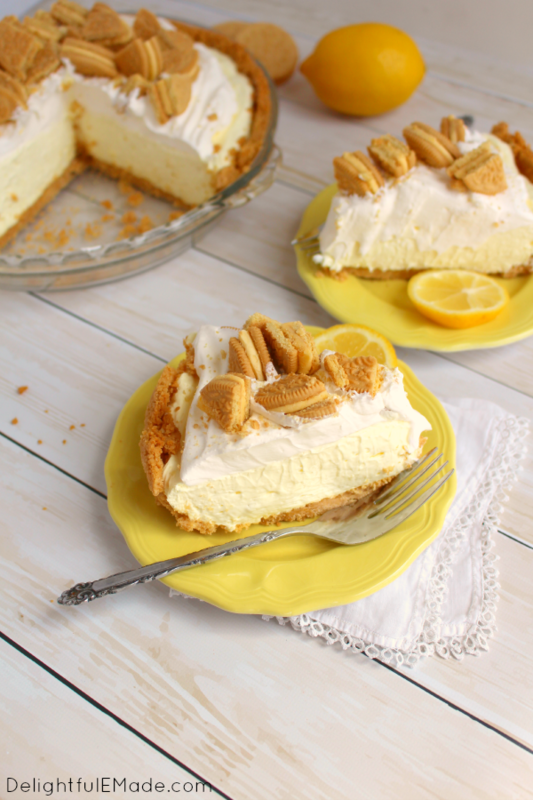 The best lemon pie you’ll ever have! 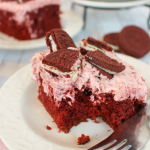 Made with a lemon OREO crust, filled with a creamy lemon filling and topped with more crunchy lemon OREO cookies, this dessert will be the highlight of your day! 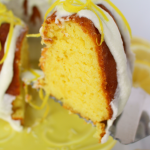 If you love a dessert that’s easy to make and packed cool, creamy, lemon flavor, then I’ve got a good one for ya! 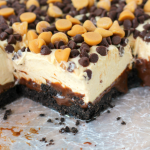 I actually came up with this dessert while grocery shopping. I noticed while at my local Target that there was a new seasonal Oreo – these amazing lemon Oreo’s. 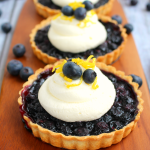 I immediately though, “I’ve GOT to make these into an amazing dessert… a lemon pie, yes! 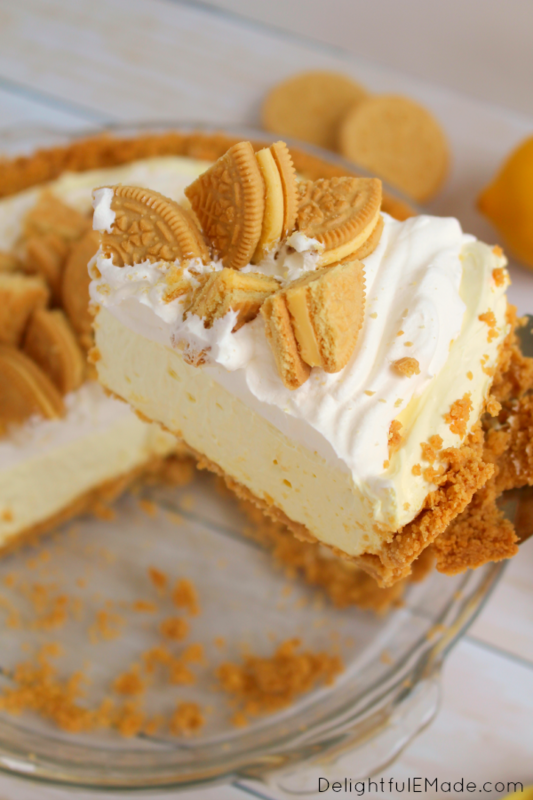 A Lemon Oreo Icebox Pie to be exact. This pie was a cinch to make. In fact, the only baking required was just a quick 8-10 minutes for the crust. 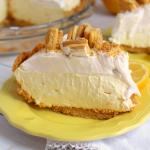 The rest was simply using your mixer to make the filling, which requires some pretty simple ingredients like cream cheese, whipped topping and lemon pudding mix. I topped the pie filling with a bit more whipped topping, which added a nice layer of extra creaminess to the pie. 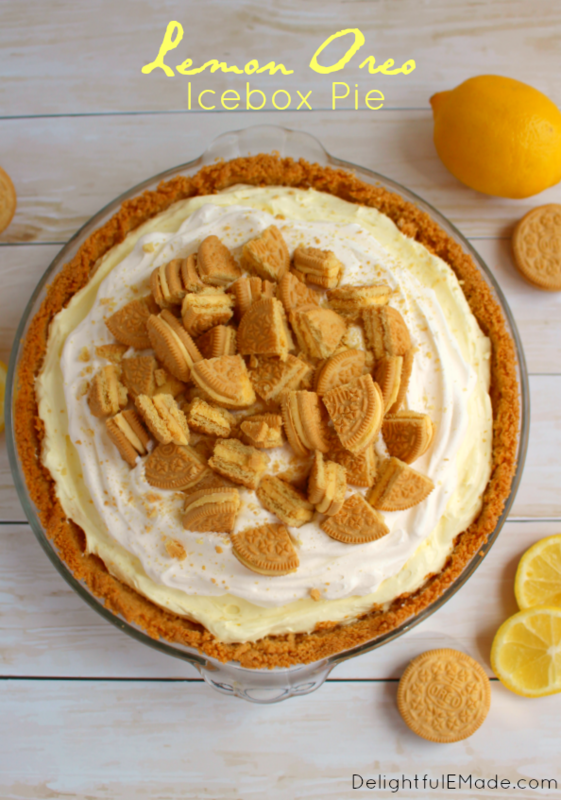 I then added the rest of the Lemon Oreos to the top, which adds a fantastic lemon crunch which compliments the creaminess of the pie perfectly! 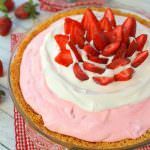 This pie is a wonderful spring or summer dessert. 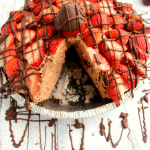 It would be fantastic for a Mother’s Day brunch, party or family gathering. 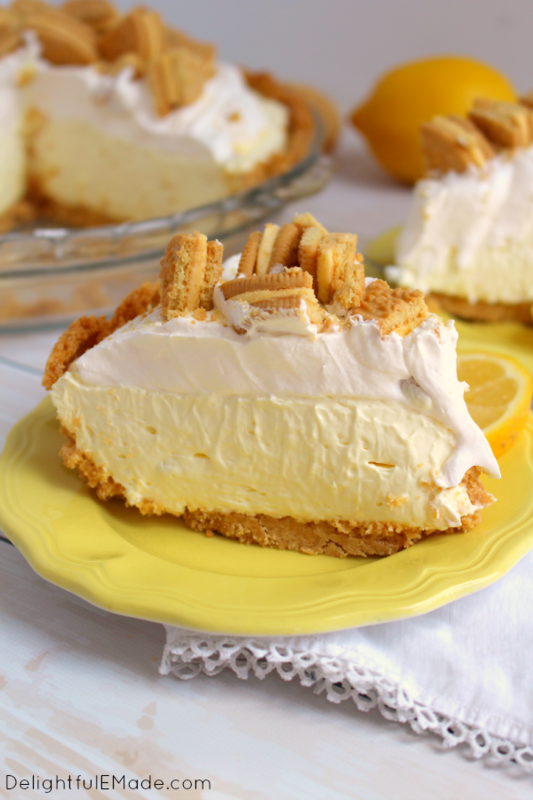 The best lemon pie you'll ever have! 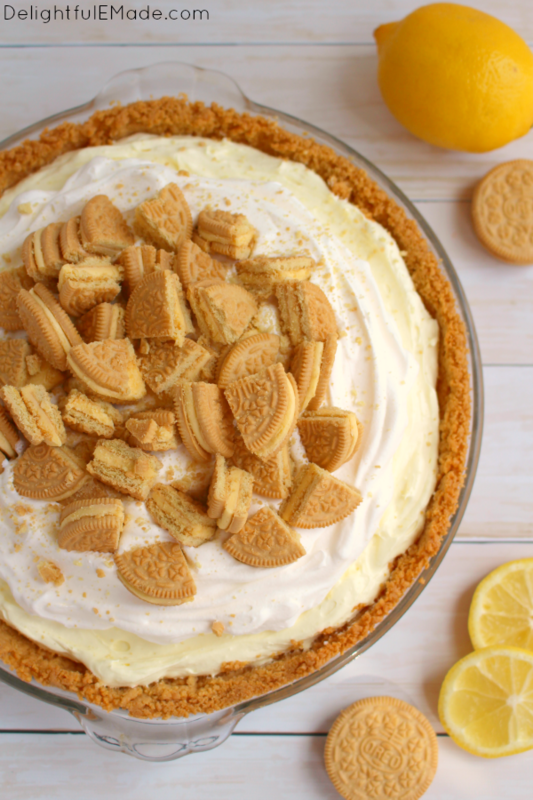 Made with a lemon OREO crust, filled with a creamy lemon filling and topped with more crunchy lemon OREO cookies, this dessert will be the highlight of your day! Preheat oven to 350 degrees. 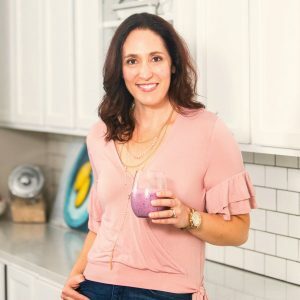 In a food processor, crush about 22 of the oreos. Pour the oreos into a 9" pie plate. Stir in the melted butter, and press the mixture to the bottom and sides of the pie plate, forming the crust. Bake at 350 for 8-10 minutes to set the crust. Remove from oven and let cool completely. With a hand or stand mixer, cream together the room temperature cream cheese and sugar until smooth. Add the milk and pudding mix, and beat until smooth and creamy. Lastly, fold in half (8 oz) of the whipped topping to the pudding mixture. Pour the filling into the cooled pie shell. Refrigerate for 2-3 hours or until set. Top the pie with the remaining whipped topping, and Oreos. Enjoy. how long would this last in the fridge? I was hoping to make Thursday night and have it for Saturday's dinner dessert.